So, my wife and I are very outdoorsy and have been for many years... but never got around getting a proper off road vehicle. We are considering getting a cheap 4x4 to beat up. She was convinced after seeing an Xterra going in 2 feet deep of water without a lift and also seeing it’s articulation. I was thinking something under 5k, not extremely high miles, auto or manual, rear lockers are a PLUS, preferably body on frame. Want to get into this slowly and then in a future get a proper Wrangler. I was also looking at some XJ Cherokees, YJ and TJ Wranglers, Tacos (those are expensive even with high miles), Frontiers, etc. Please let me know suggestions and thoughts. Thanks! Last edited by Engineer90; 04-15-2019 at 11:24 AM. Jeep XJ is cheap, reliable, a lot of them are already modified. They aren't valued nearly as high Wranglers, but are more limited in articulation than the wrangler without big lifts and or fender cutting. How extreme are you looking to go? I do like the XJ Cherokees. A buddy of mine had one like 10 years ago. I wasn't too sure about them but as you said they seem to be reliable and I have found a few that are already lifted with 33s or 35s. Not too extreme. The place I want to explore is the Pine Barrens here in NJ. There is no rock crawling, but tiny hills, water crossings, and some serious dips. I think the Xterra would be a fine choice. Why not just get a Wrangler though? Watch for rust on those Xterras or anything that old in general. Like, crawl under it with a hammer and make sure it doesn't go through the frame when you whack it. Last edited by Baltimoron; 04-15-2019 at 01:12 PM. I was drooling over this yesterday morning while perusing CL. I had an 04 Xterra way back so I can't really comment on reliability but I can say that it was a pretty capable rig. We took it camping a lot and it mainly saw forest service roads and logging roads with the occasional rough patch between. It handled them all great. Mine was a supercharged v6 which really doesn't mean much at about 210 hp. They are slow and get meh MPG but that's not what they're really about anyway. As far as I know they did not come with lockers from the factory (mine didn't) but they do have low range. Also, a weird quirk that I remember is that the rear seats fold flat but you have to remove the seat bottoms to do it. Then you have to find a place for them or leave them at home. Xterra's have issues with the integrated trans cooler in the radiator cracking and allowing coolant to enter the trans fluid resulting in catastrophic damage. There is a Stillen aluminum replacement available that doesn't have this issue. Two winters back I opted for a 2001 4Runner. 206,000 miles for $4,000. It's never left me stranded and hasn't required any repairs. I did the radiator and lower ball joints as preventative maintenance. I love the damn thing to death. Last edited by lyonsroar; 04-15-2019 at 02:05 PM. Isn't that just on the '05+ generation? Specifically '05-'10. Also, looks like you can just bypass the transmission cooler. That 2Door XJ is cool but it is not worth $9500 with a D35 rear axle. Hope he did a C-Clip eliminator when that lunch box locker was installed. Maybe XJs are cheap where the OP is, but around here they are priced like they come with a brick of gold in the trunk. XTerra sounds perfect for getting his feet wet. OP, I don't want to rain on your parade, but I would consider holding out for a Wrangler. Invest in one of these, and you likely end up spending on repairs/maintenance/improvements and such and delay the Wrangler even further. Your budget isn't too far off an older Jeep and those AMC straight 6s are not only cool but supposedly make for a fun package. OP is in NJ; maybe it's a little better there but here XJs are either rusted to dust or immaculate (and pricey) garage queens. I would love it if that weren't the case though. Best 4.0L XJ/ZJ/WJ you can find for your money. It is also only on the automatic models, it doesn't effect anything with a manual trans. The 2nd gen Xterra had a factory rear e-locker on the Off Road package models that were later renamed to Pro-4X. So this is what I'm getting. 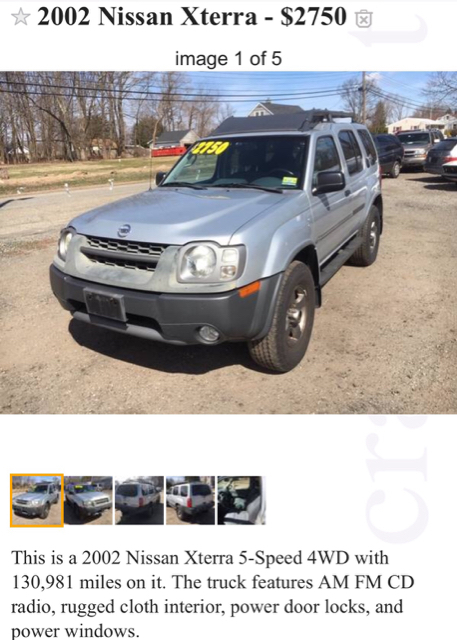 If I go with an Xterra, 2005 and older with manual is the safest bet. 4Runners and XJ Cherokees are solid choices. Most older Wranglers are good too but gotta watch out for rust... which basically applies to most trucks. I would love a JL 2-door or a JLU, but problem is that they are pricey and you don't get the best. What I mean by that is that both engine choices as of now are imo underpowered. My GTI has the same torque as a JL whether it's the 2.0T e-torque or the Pentastar. If it came with a HEMI or a high torque diesel, then I'd be singing a different tune. If you want a "offroad" SUV with a V8, your only choices are a Lexus GX or a 4th gen 4Runner, or a H3 Alpha. Edit: Oh wait Land Cruisers too, duh. Last edited by Quinn1.8t; 04-16-2019 at 09:08 AM. If I buy something used like an Xterra or a old 4Runner to beat up, I don't need a V8. Find the best 3rd Gen 4Runner you can and be happy. With it being TCL and all, I figured there'd be one guy suggest a Subaru in a BOF 4x4 conversation. This is probably your best bet outside of the Xterra. Like others have said, watch for coolant and transfluid intermix and you should be good to go. A ZJ or WJ would also be a solid choice. You'd just want to add a small lift and a locker. TCL, I summon you. I need your help (MCS content). TCL I need your help! TCL, I need your help!